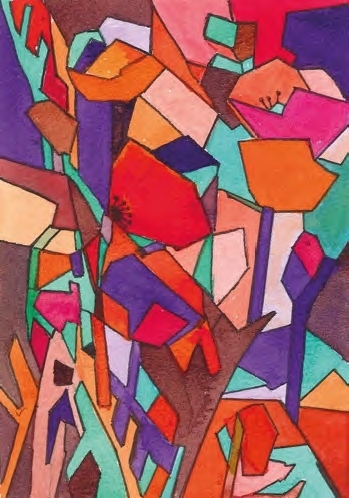 Poppies , acrylic ink, 7x912⁄ in. (18x24cm). This was treated in the same way as the finished abstract (right), this time using transparent acrylic inks. I decided to use brighter, more vivid colours for another painting, based on poppies. I chose coloured inks, some of which were diluted in water and the shapes defined as the previous painting, with ink lines. Because I kept the colours transparent and flat, with no shading, the result looks like stained glass.